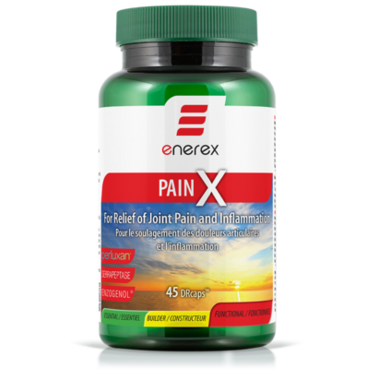 Enerex Botanicals Pain X offers potent natural anti-inflammatories with proven and patented ingredients including Serrapeptase, Perluxan®, turmeric, and Enzogenol®. This unique combination of effective ingredients works to reduce or block pain inducing compounds from disease, infection, or injury. This product works fast, bringing much needed relief that can last longer than other over-the-counter medicines. Directions: Adults: Take 1 capsule 3 times daily with or without food or as directed by a health care practitioner. Non-Medicinal Ingredients: Vegetable magnesium stearate, microcrystalline cellulose, silicon dioxide, gellan gum, hypromellose (vegetarian cellulose complex DRcaps = Delayed Release capsule).